With increased participation in high school and college sports, and injuries, including to the teeth, on the rise as well, the National Athletic Trainers' Assocaition has issued new guidelines (1) on how to prevent and manage sport-related dental and oral injuries through the use of mouthguards. Despite research showing that athletes who do not wear mouthguards are 1.6 to 1.9 times more likely to sustain an orofacial injury compared to those who wear them, mouthguards are mandated in only a few sports by both the NCAA and the National Federation of State High School Associations. 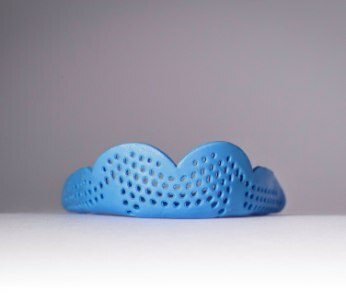 In sports which do not mandate mouthguards, such as baseball, basketball and soccer, orofacial injury rates range from approximately 3 percent to 38 percent of all sport-related injuries. All athletic trainers and other health care professionals responsible for athlete care should be familiar with the NATA position statement  on emergency planning in athletics. Clinicians responsible for the dental care of athletes should identify an appropriate oral health care specialist (preferably with additional training in sports dentistry) for direct referral. Health care professionals providing onsite care to athletes should carry a dental trauma pack with their sideline sports medicine kit. A complete list is included in the new position statement. Contents may be modified based on the needs of a specific sport or team. Clinicians responsible for emergency dental care of athletes should have adequate knowledge of the structure and function of the teeth and jaw. They should also be able to recognize the signs, symptoms and classifications of acute dental injury. Given the overlap between sport-related dental and concussion mechanisms, athletic trainers and other health care professionals should perform a thorough concussion evaluation (refer to the NATA position statement on the management of sport concussion ) in conjunction with the orofacial examination. Health care professionals, athletes, parents and coaches should be educated on the importance of wearing a properly fitted mouthguard and be familiar with the classification systems used to characterize mouthguards. They should also know the international, national and state governing body rules, regulations and requirements related to mouthguard use associated with various sports. Mouthguards are consistently effective at protecting against orofacial injuries. Athletic trainers, coaches and parents should encourage athletes to wear properly fitted mouthguards when participating in sports activities associated with increased orofacial injury risk. Mouthguards are not recommended for preventing mild traumatic brain injury or sport-related concussion, as no high-quality scientific evidence  currently supports using any type of mouthguard or mouthguard material for this purpose. Properly fitted mouthguards can be used by athletes in both aerobic and anaerobic sports. Use of these devices has no negative effect on breathing or strength. Likewise, mouthguards should not be recommended to athletes to improve performance, as no high-quality evidence supports this claim. While working within the scope of their respective state practice acts, clinicians responsible for fabricating and fitting athletic mouthguards should strive to meet suggested fabrication (i.e., fit) recommendations. In younger athletes, whose mouths are continually developing, the mouthguard should be routinely inspected for fit and retention to accommodate tooth eruption, growth and changing contact between upper and lower teeth. Athletes should be instructed to wash the mouthguard with a mild antimicrobial soap and rinse it thoroughly in lukewarm water both before and after use. The mouthguard should then be stored in a clean, rigid, ventilated plastic container. Mouthguards should not be exposed to prolonged direct sunlight or sources of heat, as deformation may occur and reduce its protective capabilities. Athletes should examine the mouthguard daily for fit and for any damage (e.g., tear in material or loss of resiliency). The mouthguard should be replaced if it is loose or damaged. "It's important to recognize the often overlooked financial burden of oral and dental injuries," says lead author Trenton E. Gould, PhD, ATC, associate dean, College of Health, and professor, School of Kinesiology, at the University of Southern Mississippi. "Treating a dental trauma, such as an entire tooth being knocked out, can cost upwards of $10,000. Effective management of sport-related dental injuries is critical to the long-term financial, physical and emotional health of anyone who has experienced dental trauma." "Athletic trainers, as well as other health care professionals, play a pivotal role in the effective management of oral and dental injuries, says Gould. "This is critical to the injured athlete's long-term oral health outcome and overall physical and mental well-being." 1. Gould TE, Piland SG, Caswell SV, Ranalli D, Mills S, Ferrara MS, Courson R. Preventing and Managing Sport-Related Dental and Oral Injuries. J Ath Tr. 2016;51(10):821-839 (accessed at http://natajournals.org/doi/pdf/10.4085/1062-6050-51.8.01). Additional source: National Athletic Trainers' Association press release dated December 9, 2016. With participation in high school and college sports and injuries, including to the teeth, on the rise, the National Athletic Trainers' Association has issued new guidelines on preventing and managing sport-related dental and oral injuries through the use of mouthguards.